Back to falling snow and colder temperatures today. I had planned to meet a couple of friends at a city park this morning, but we’ve just cancelled, as the roads will be really bad. On 25 January 2014, I spent an amazing day south of Calgary with friends Cathy and Terry. I had found an e-mail on my computer around 12:45 a.m., just as I was about to turn off my computer for the night. Did I want to go birding tomorrow and, if so, to meet at 8:00 a.m.? A full day of excitement and enjoyment left me tired out, but so happy. I had been missing being out and taking photos, feeling lethargic and extremely tired, so this invite was welcomed with open arms. The crazy weather soared to a balmy 11C, but a lot of the day was colder, with a strong wind! Along one of the roads, we came across these and other bright red granaries/sheds – I always love to see anything bright red in a snowy, wintry setting. Can you believe that we saw 16 owls (oops, when I first posted this info under a previous photo, we thought we had seen 17, but after viewing all their photos and videos, my friends reckon that we "only" saw 16, ha. SIXTEEN! 8 Snowy Owls and 8 Great Horned Owls. The closest Snowy Owl was seen when it was early evening and the light had gone, and my photos are all blurry. The other owls were little more than a tiny speck in the far, far distance, but I still managed to get some kind of shot of some of them, using 48x zoom plus cropping. Perhaps I should add that maybe 15 of the owls that were seen would never have been seen by less experienced birders (and I include myself in that category!). My friends have brilliant eyes when it comes to spotting owls! Just left me shaking my head each time they found one! I’m not too bad at finding owls, but not at that distance! An interesting link, with the information below, that answers the question: "WHY ARE BARNS USUALLY PAINTED RED?" 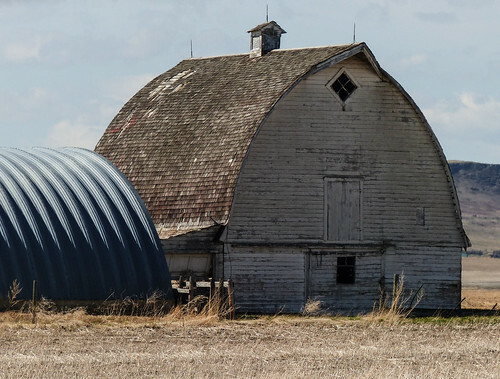 "If you’ve ever driven through a rural area, it’s likely that you’ve seen the red barns that speckle the farming landscape. There are several theories as to why barns are painted red. 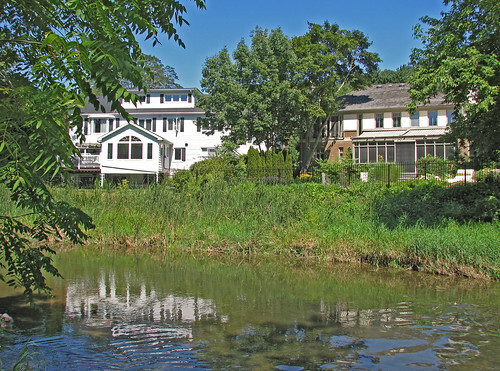 Hoggs Hollow is an affluent neighbourhood in Toronto, Ontario, Canada which is located in the Don River Valley centred on the intersection of Yonge Street and York Mills Road/Wilson Avenue. Hoggs Hollow is named after Joseph hogg, a Scotsman who settled in the area in 1824. Hogg operated a whisky distillery and a grist mill, and was viewed as the most successful of all the millers in the valley. The name is usually written without the apostrophe as Hoggs Hollow, but sometimes appears as Hogg’s Hollow. In 1856, John and William Hogg, sons to the late James Hogg, subdivided their father’s estate under the name "Hoggs Hollow". The Hoggs Hollow subdivision included one hundred and forty-one lots. With the area full of quick sand, swamps and bogs, only a few houses were actually built at this time, however. the subdivision stood in close proximity to the historic village of York Mills. A school, post office, pottery, blacksmith, livery, stable, store, golf links and clubhouse, hillside cemetery (at Yonge Street and Mill Street) and St. John’s Anglican Church served the community, one largely made up of Scottish, Irish and English immigrants. Subdivision of the present day Hoggs Hollow neighbourhood began in the 1920s with the creation of lots, layout of roads, and design of homes reflecting the aesthetic of the English countryside. In 1925, a two room elementary schoolhouse named the Baron Renfrew School opened to replace an earlier structure at 45 York Mills Road (formerly Mercer Avenue and/or concession road 19) that was destroyed by fire. The neighbourhood grew in stages and was finally completed in the 1960s. Both St. John’s Anglican Church and Baron Renfrew (renamed York Mills Public School) grew in size with various additions added. Agricola Finnish Lutheran Church was built in 1967, serving Toronto and area’s Finnish Lutheran community. Hoggs Hollow was connected to Toronto by the Yonge St. streetcar until it was replaced by the Toronto Transit Commission’s Yonge Subway in the early 1970s. Hoggs Hollow is now served by the York Mills subway station. In 1982, York Mills Public School was decommissioned and renovated as office space for the school board. The historic two room schoolhouse exterior was restored. Hoggs Hollow was a part of the City of North York until 1998 when that city merged with five other municipalities and a regional government to form the new "City of Toronto". I determined at the incredibly previous second to try out and get a image of this old barn as we were being driving previous it. Helps make a adjust from a far more typical red barn, and I appreciated the form of it. “If you’ve ever driven as a result of a rural region, it is really probable that you’ve seen the red barns that speckle the farming landscape. There are many theories as to why barns are painted red. Centuries in the past, European farmers would seal the wood on their barns with an oil, typically linseed oil — a tawny-colored oil derived from the seed of the flax plant. They would paint their barns with a linseed-oil combination, typically consisting of additions these types of as milk and lime. The mixture produced a very long-lasting paint that dried and hardened swiftly. 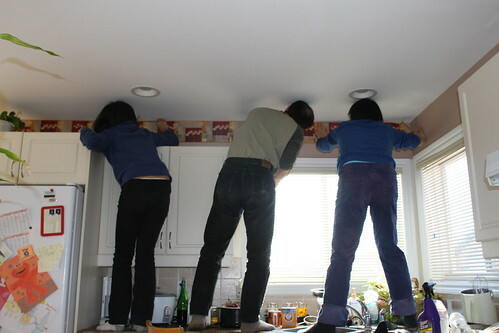 (Right now, linseed oil is bought in most home-enhancement retailers as a wood sealant). Now, where by does the red arrive from? In traditionally accurate terms, “barn red” is not the vibrant, fireplace-motor red that we typically see these days, but far more of a burnt-orange red. As to how the oil combination turned typically red, there are two predominant theories. A single is that rich farmers additional blood from a latest slaughter to the oil combination. As the paint dried, it turned from a vibrant red to a darker, burnt red. The other is that farmers additional ferrous oxide, otherwise known as rust, to the oil combination. Rust was plentiful on farms and is a poison to numerous fungi, which include mildew and moss, which were being known to developed on barns. These fungi would lure humidity in the wood, rising decay. 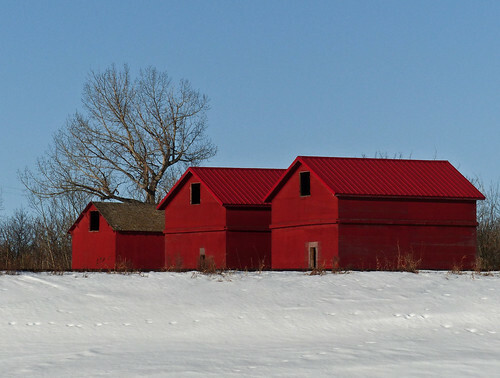 Irrespective of how the farmer tinted his paint, having a red barn turned a modern detail. They were being a sharp contrast to the classic white farmhouse. As European settlers crossed around to The us, they introduced with them the custom of red barns. In the mid to late 1800s, as paints started to be produced with chemical pigments, red paint was the most reasonably priced to obtain. Pink was the shade of favor till whitewash turned more cost-effective, at which point white barns started to spring up.